Despite the many challenges facing Afghanistan , the country can boast some major successes and perhaps none is more amazing than the success of its media. In name, at least, we now have a free press. It certainly is refreshing to learn about “major successes” in Afghanistan. Except… well, what does it exactly mean to have a free press “in name”? That qualifier is a bit puzzling to us. Just to help put things in perspective, would it also be fair to boast of women’s rights in Afghanistan (see previous post), and then add “at least in name”? Ditto a functioning democracy “at least in name”? How does “at least in name” protect journalists from intimidation or women from violence? Truth is -and somebody else may have already delivered this truth in these colorful terms- that having freedom of press is a bit like pregnancy. You are either pregnant, or you are not -you cannot be a little pregnant; just like you cannot have freedom of the press only in name. The sad reality about freedom of press in Afghanistan is that there just isn’t any, well, except in name. In a recent Statement Afghanistan’s National Journalists Union (ANJU) accused the Ministry of Information & Culture of attempting to transform the national media “into a propaganda tool in the hands of the executive branch,” and argued that the ministry is over-stepping its limits and acting in direct violation of the Afghan Mass Media Law of 2006. The statement also points out the ministry’s suspension of the Comission for Media Complaints and Violations, forcing journalists to directly refer to the General Attorney for redress of their concerns. The statement concludes by saying that the union is “deeply worried” about the recent measures taken by the ministry, and about the new challenges facing freedom of speech in Afghanistan. On a related note, the recent news about American soldiers confiscating cameras and threatening photographers in the aftermath of civilian deaths near Jalalabad further undermines the already dismal state of affairs for freedom of press in Afghanistan. 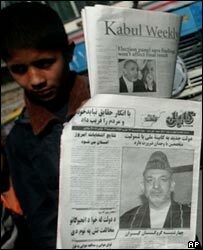 It used to be that on his American trips, whenever asked, Mr. Karzai would affectionately joke about the toughness of the newspapers in Afghanistan on his administration. It turns out he might have just appointed the right person as his Minister of Information & Culture to whip them into line. PS. Word to Freedom House: I cannot, in good conscience, cite your figures for freedom of press in Afghanistan when I know too well that your figures for Afghanistan’s ethnic composition are grossly misleading. This entry was posted on Saturday, March 10th, 2007 at 2:06 am and is filed under Book/Report/Media/Blog, Press Freedom. You can follow any responses to this entry through the RSS 2.0 feed. You can leave a response, or trackback from your own site. Ancora una volta, grazie Giovanni. Given your interest in Afghanistan, we thought you might be interested in our latest report, Breaking Point: Measuring Progress in Afghanistan. (http://pcrproject.com/blog/2007/02/23/download-new-report-breaking-point-measuring-progress-in-afghanistan/) The PCR Project is a part of the Center for Strategic and International Studies, a think-tank located in Washington, DC. Much more on Afghanistan and Pakistan can be found at http://www.pcrproject.com. You know thinking about freedom of press in Afghanistan it blushed in my mind a shot of “The General’s War” of Olly Lambert, in which General Richards leads a meeting with the Afghan associated press and basically manage to tell them what he wants them to think and shut them all up. I found it quite…..sad, also because it is not fiction. You can check something more about it on my blog.